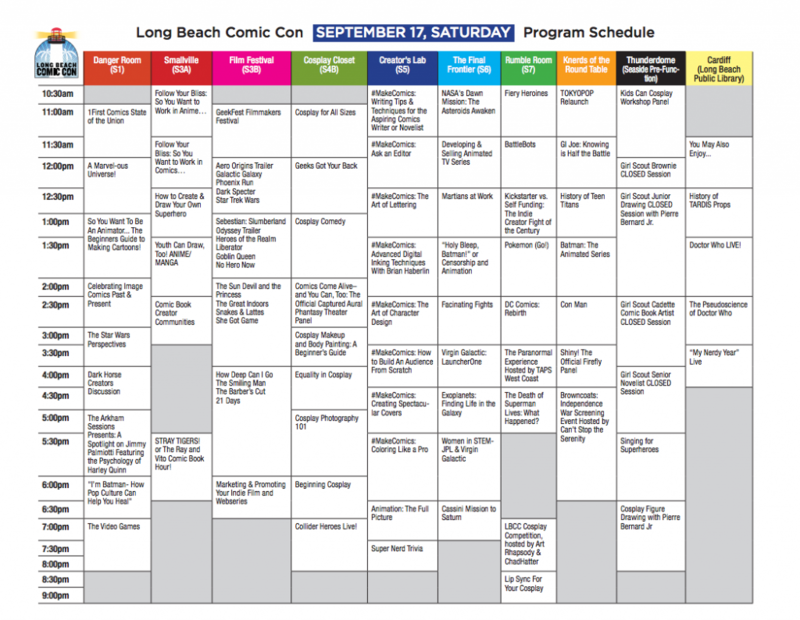 If you’re heading to Long Beach Comic Con next weekend, we’ve got your survival guide right here. Although LBCC isn’t nearly as difficult-to-navigate as some of the larger events, it has its fair share of panels, parties, events, and great vendors on the floor. This should help. 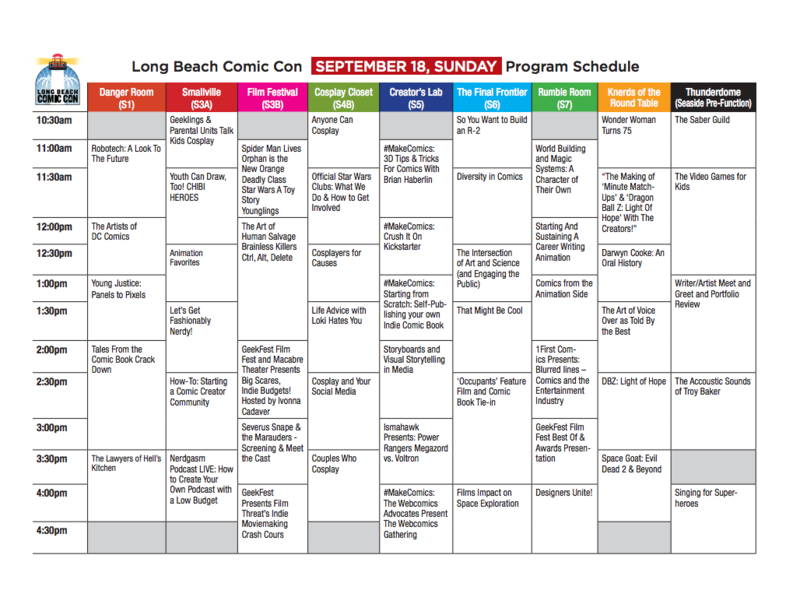 The 8th annual Long Beach Comic Con will be held on September 17 and 18, 2016 at the Long Beach Convention Center, featuring an impressive array of more than 120 pop culture guests, more than 130 panels, and unique partnerships with the Columbia Memorial Space Center and Girl Scouts of Greater Los Angeles. Among the guests attending Long Beach Comic Con for the first time are Kevin Conroy and Loren Lester who played Batman and Robin on BATMAN: THE ANIMATED SERIES, Summer Glau, Sean Maher, Adam Baldwin, Jewel Staite from Joss Whedon’s FIREFLY, Andy Park (Marvel Studios Visual Development Supervisor and Lead Concept Artist) and acclaimed comic book creators including Peter David and Colleen Doran (AMAZING FANTASTIC INCREDIBLE), Steve Epting (VELVET), Joelle Jones (LADY KILLER) and Joe Eisma and Nick Spencer (MORNING GLORIES). The Columbia Memorial Space Center will partner with Long Beach Comic Con for Space Expo 2016, an innovative and one-of-a-kind program that connects comic book convention attendees directly with the world of scientific discovery. This year Long Beach Comic Con will also have more than 400 Girl Scouts in grades K–12 attending Long Beach Comic Con, with nearly 100 of them coming from underserved areas. Depending on their grade level, the girls will earn Comic Artist, Drawing, Senses, Novelist, or career exploration-related badges for meeting with talented creators and participating in interactive workshops. Click here for complete schedule of programming. Come celebrate Wonder Woman’s 75th Anniversary at the Official Long Beach Comic Con Drink & Draw! Enjoy themed drinks and win raffle prizes as you watch your favorite artists draw their version of the Amazing Amazon. Each piece of artwork will promptly be auctioned off by the lovely Michelle Jensen, founder of Nerd Out App with the majority of the proceeds going to the Hero Initiative. And check out our COMIC CON PREP SHOW. This week, we talk about Long Beach Comic Con and Dragon Con!